Dr. Lesser of Norwich Regional Animal Hospital shares the top 10 things every cat owner needs to keep their feline friend healthy and entertained. 1. 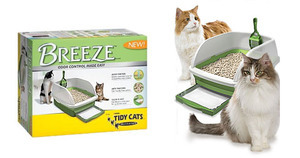 Tidy Cats Breeze Litter system: The Breeze litter system helps you control odors with pellets that separate the urine. Easy-to- change pads and anti-tracking pellets make it seem like you don’t have a litter box at all. 3. Heartworm preventative for outdoor cats: If your cat enjoys the outdoors, make they’re on a monthly heartworm preventative. 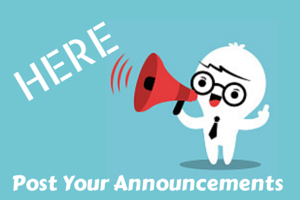 We recommend a monthly chewable or topical treatment. 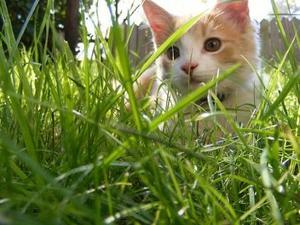 Talk to your veterinarian to determine which is best for your cat. 4. KONG ZoomGroom cat brush: The ZoomGroom brush does an amazing job grooming your cat. The rubber fingers are a magnet for loose hairs and reaches through the coat to pamper your cat with a nice massage. 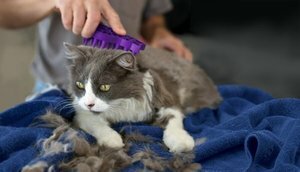 Regular brushing and grooming is essential in preventing hairballs and mattes. 5. 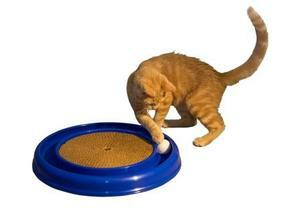 Cat Dancer toy: This simple, inexpensive toy could quickly become one of your cat’s favorites. 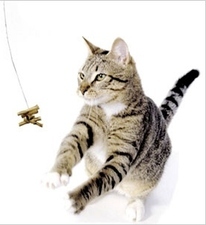 Made of a spring steel wire and some pieces of rolled cardboard, the toy is a lure for almost any cat. 6. Ball in Track cat toy: Another favorite for many cats, this toy has many variations. Some are scented with catnip, others incorporate a longer track for the cat to chase. With a scratching pad in the center, this toy is a complete cat entertainer. 7. Sleepy Pod Cat Carrier: This specialty carrier receives high marks from us! Safe for air or car travel, the carrier also doubles as a bed, allowing your cat to feel much safer with the familiar scent and surroundings. 8. Feliway: Available in a spray or full-room diffuser, Feliway is a calming feline pheromone made to mimic the pheromones that cats release when they rub up against someone or something. We use it in our exam rooms, creating a friendly and familiar space for the cat to feel at home. 9. Cat Pill Pockets: If your cat needs regular medication, or becomes sick and is prescribed pills by your veterinarian, these small treats are very handy in ensuring your cat takes their meds. The treats are hollow, allowing for a pill to be inserted and disguised. Fluffy won’t know any better with how great they taste. 10. Tartar Shield Treats: Dental health is important for any pet, but with cats, it may prove to be a bit more difficult to prevent tartar and decay. These small treats are clinically proven to clean teeth, freshen breath, reduce bacteria, and even prevent plaque buildup. And what cat doesn’t love more treats? !